Ward and Agent 33 embark on a personal mission. Hunter finds himself in hot water after discovering Mack and Bobbi’s secret, putting him face-to-face with the man targeting Agent Coulson. AS COULSON STRUGGLES TO KEEP THE TEAM TOGETHER, BOBBI AND MACK REVEAL THEIR TRUE ALLEGIANCE, ON "MARVEL'S AGENTS OF S.H.I.E.L.D." "Love in the Time of Hydra" - Coulson and his team are still reeling from a shocking revelation that leaves the team fractured as they must decide what to do with one of their own. Meanwhile, Bobbi and Mack reveal their true allegiance to Hunter, while elsewhere, Ward and Agent 33 embark on a personal mission, on "Marvel's Agents of S.H.I.E.L.D.," TUESDAY, MARCH 24 (9:00-10:00 p.m., ET) on the ABC Television Network. "Marvel's Agents of S.H.I.E.L.D." stars Clark Gregg as Director Phil Coulson, Ming-Na Wen as Agent Melinda May, Brett Dalton as Grant Ward, Chloe Bennet as Agent Skye, Iain De Caestecker as Agent Leo Fitz, Elizabeth Henstridge as Agent Jemma Simmons, Nick Blood as Lance Hunter and Adrianne Palicki as Bobbi Morse. 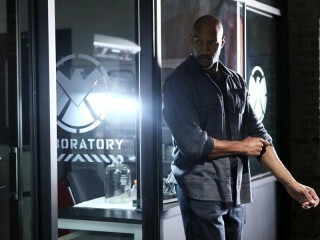 Guest starring are Henry Simmons as Alphonso "Mack" Mackenzie, Adrian Pasdar as Brigadier General Glenn Talbot, Edward James Olmos as Robert Gonzales, Christine Adams as Agent Weaver, Kirk Achevedo as Agent Calderon, Mark Allan Stewart as Agent Oliver, Simon Kassianides as Sunil Bakshi, Raquel Gardner as Carla Talbot, Maya Stojan as Agent 33, Landall Goolsby as Selwyn, Gigi Bermingham as Rhonda, Scott Speiser as station guard, Parisa Fakhri as Lieutenant Decker, Anna Campbell as female major, Shannon McClung as short officer, Meredith Bishop as Officer Anderson and Kieren Van Den Blink as female Lieutenant.